China's growing prowess in cyberspace is a bigger, more dangerous threat to the United States than Russia's attempt to undermine U.S. elections, Washington's top intelligence official said, warning that Beijing is on a path that could lead to global supremacy. Director of National Intelligence Dan Coats characterized the Chinese threat as deliberate, methodical and subtle, allowing it to escape the type of notoriety that has followed Moscow's exploits. Specifically, he cited China's use of its ongoing crackdown on Muslims in the Xinjiang region as a testing ground for its cyber capabilities. "Chinese officials in the Muslim northwest have instituted high-tech surveillance measures, including the collection of DNA and other biological data throughout the region, with Chinese technology companies at the forefront of these actions," he told a cybersecurity conference Tuesday at The Citadel, a military college in Charleston, South Carolina. He said China is also experimenting with a "social credit ratings program," using intrusive surveillance to determine access to bank loans, educational opportunities and even medical care. "The result of this effort is nothing short of a future that involves the perfection of the surveillance state," Coats warned, adding it also "threatens the export of these tools abroad to other authoritarian regimes." 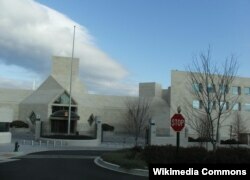 FILE - The Chinese Embassy in Washington. An attempt to reach officials at the Chinese Embassy in Washington for reaction to Coats' comments went unanswered, though Chinese officials have previously sought to downplay concerns about their use of cybertechnology in Xinjiang. One Chinese official claimed last week in Geneva that China's use of surveillance is no more intrusive than that used by Western countries like Britain. "Do I have concerns with the Chinese? Huge concerns with regards to their ability to leverage their industry," Defense Intelligence Agency Director Lt. Gen. Robert Ashley said last week in Washington, referencing concerns Beijing could use Chinese-made products to spy on Americans. 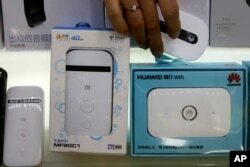 FILE - A Huawei mobile internet device and a competing product from ZTE Corp. are displayed for sale at a computer mall in Beijing, July 4, 2018. "My bigger concern may not necessarily be what's taking place on the battle space if I can't turn the power on," Ashley said. "Imagine a world 15 or 20 years from now where our entire communications network is embedded with component pieces made by a company that can remotely control those component pieces by a foreign adversary," Republican Sen. Marco Rubio said at a conference this past June during a speech about China. "It would be a threat this country has never faced." A July 2018 report by the U.S. National Counterintelligence and Security Center found that while China's cyber operations have slowed since a 2015 agreement with the U.S., Beijing "continues to use cyber espionage to support its strategic development goals." Most of the Chinese operations target defense contractors and information technology, as well as communications companies "whose products and services support government and private sector networks worldwide." And U.S. officials believe China's malicious cyber activities are growing. "China is expanding its intrusions," FBI Deputy Director David Bowdich said Tuesday, calling China the No. 1 counterintelligence threat. "We find them stealing our ideas, our intellectual property, trying to obtain our innovation," Bowdich said, calling the Chinese efforts "incredibly effective." U.S. intelligence officials are also increasingly concerned that China's efforts, while methodical, are becoming increasingly bold. China is no longer "hiding its strengths and biding its time," Coats warned Tuesday. "Beijing is working against the values that the international community has championed, including protecting personal privacy, the free flow of information and the protection of commercial secrets."